Sunnyside Dru: PASA field day! This Thursday we will host a PASA (Pennsylvania Association for Sustainable Agriculture) field day here on the farm. Last October we hosted a field day here, and then in February Homer spoke at a couple of sessions at the conference...it is good to think about presenting what is done here, how to explain and demonstrate all that we do, and why. Farming with as little equipment as possible, adding and improving each year as we can afford to do so, without a tractor or rototiller or, most importantly, taking on much debt, are all really important aspects of what we do. So our big room is cleaned up. Emptied. 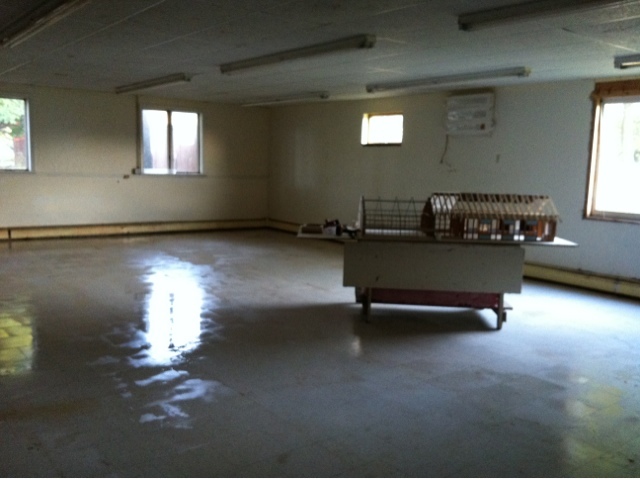 The floor washed, junk that accumulates sorted, pitched, recycled, freecycled. And ready for visitors!